Mueller, pictured Monday at the Detroit auto show, is due to meet with U.S. authorities on Wednesday. 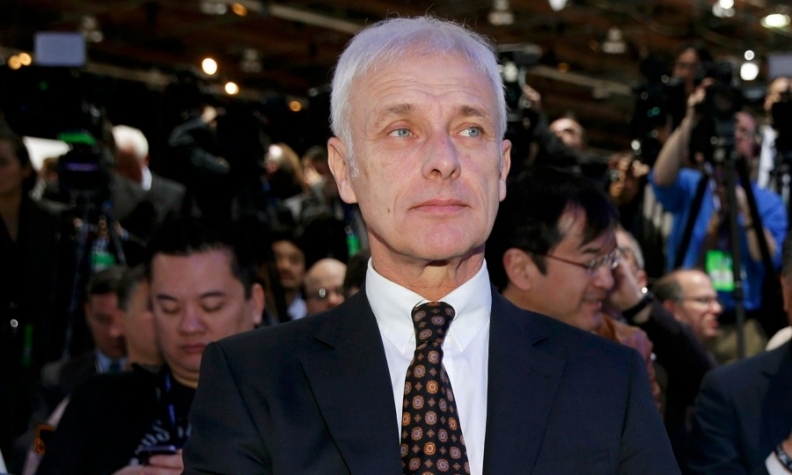 DETROIT (Reuters) -- Volkswagen Group does not expect additional costs from fixing U.S. cars capable of cheating diesel emissions tests, CEO Matthias Mueller said. "We have prepared 6.7 billion euros ($7.28 billion) for the repair process of all the cars globally. We suppose that that should be enough," Mueller said in an interview with Reuters TV at the Detroit auto show. Mueller will propose to the U.S. Environmental Protection Agency (EPA) a new catalytic converter that VW says could be fitted to about 430,000 rigged U.S. cars. Mueller is due to meet EPA administrator Gina McCarthy in Washington on Wednesday, where he plans to make the proposal, which he said includes technical solutions, a "theoretical" offer to buy back cars and a time schedule. Christopher Grundler, director of the EPA's Office of Transportation and Air Quality, said he didn't know if a VW proposed catalytic converter will fix the U.S. diesel vehicles. "Given the circumstances and the past history, we're not going to approve anything until it's thoroughly tested and we're convinced that it addressed the non-compliance and it’s good for owners," Grundler said. VW has admitted fitting software that can cheat emissions tests in 11 million vehicles sold worldwide including 8.5 million in Europe. German authorities last month signed off on VW's proposed fixes for the engines sold in Europe and the approval extends across the European Union's 28 national markets. EU NOx emissions limits are less tough than those in the U.S. and a resolution in Europe is shaping up to be cheaper than feared. VW still faces huge costs to cover regulatory penalties and compensation to consumers. The total cost of the scandal could theoretically reach as much as $46 billion, according to Bloomberg Intelligence analyst Kevin Tynan. Separately, Mueller expressed optimism about VW's sales outlook this year after Europe's biggest automotive group suffered the first drop in deliveries at its namesake brand as well as group level in more than a decade last year. Asked whether he was bracing for another drop in sales, the CEO said: "We have some difficult political situations all over the world, so we will see what will happen. We have a very attractive product portfolio all over the brands, so we are confident we will be successful in 2016."